"Exhibit hall of Wright Field museum"
A view of the exhibit hall at the Wright Field museum. 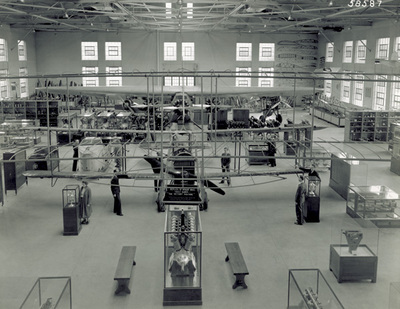 In the center, hanging from the ceiling, is a reproduction of the Wright 1902 glider built at Wright Field in 1934. The museum opened to the public in 1936.